Desert Strike: Return to the Gulf, called Desert Strike: Wangan Sakusen (デザートストライク 湾岸作戦) in Japan and better known simply as Desert Strike, is an isometric-projection shoot-em-up by Electronic Arts released for the Sega Mega Drive in 1992, and subsequently ported to other platforms. It is the first game in EA's so-called Strike series of isometric shoot-em-ups. A terrorist named General Kilbaba violently takes over a small Arab emirate and plans a major nuclear strike, to which the president of the United States orders a helicopter (A Super Apache as named in game) team in the Special Forces (US Marine Corps in the Master System version) to intervene. You are in control of one such helicopter. Missions are mostly intertwined with each other. For example blowing up a radar station will in return make you harder for enemies to hit you. Failing one of missions usually results in game over. You are also given co-pilot that will assist you with your mission. These pilots have varying degrees of skills with marksmanship and winch control. Reading their dossiers will usually give you a rough idea about their skill levels. 5th pilot Valdez is missing and can be found in first mission. He is near the north-western part of the map nearby a crashed F-14. Your helicopter has limited ammo and fuel. It also has limited armor. Without ammo, you can attack enemies. If fuel depletes, your helicopter will eventually crash and you will lose life. If armor reaches zero you will also lose a life. Ammo and fuel can be recovered by acquiring ammo boxes or fuel drums respectively with your winch. Armor can be recovered two ways : either find an Armor Repair (very, very rare. In later levels map don't even show their locations) or by rescuing people and dropping them off near a friendly landing zone. Each rescued person will increase the armor by 100 points. Be careful though as power ups can be destroyed and prisoners can be killed. Each level also has extra lives but these are, again, very difficult to find. You are required to return to your home base (usually the frigate you take off from at the beginning of each level) when you complete or fail the level. There are total of 3 lives. Losing all of them will end the game. Game contains 5 levels with different missions, with some of them having time limits. Desert Strike also has a password system. Each of the game's four levels is a separate mission with different objectives. To complete the objectives, you are given ammunition of varying power levels (shot by pressing (Hellfires and Jink), (Hydras), or (Guns), listed in order of decreasing power). Though the game uses an isometric projection, the control behaves more like a full 3D game, where using and rotates your chopper, moves you forward in t he direction you're facing, and moves you backward. Hitting allows you to access a map, a summary of the mission, and mission status. Due to limitation of buttons on Master System's control pad, control scheme is somewhat different than Mega Drive version. Pressing both and fire Hellfire, while holding down is need for strafing. Pause button is the status screen. According to Desert Strike's original design document (dated 1990-06-18), the game was originally titled Beirut Breakout, being based on the then-ongoing Lebanese Civil War . It was later advertised as Apache AHX: Desert Madman. Desert Strike's similarities with the Gulf War caused controversy at the time of release, thought to be glorifying Iraq's invasion of Kuwait. Reportedly some Gulf War veterans in the US openly burned copies of the Mega Drive game in public in protest. Main article: Desert Strike: Return to the Gulf/Magazine articles. 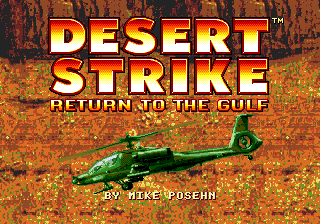 Main article: Desert Strike: Return to the Gulf/Promotional material.